Mix all the ingredients together to create a batter. Pour batter to create a medium pancake. Cook for 30 seconds on one side, & flip, cooking 30 seconds on the other side. Repeat, until the batter is done. The mixture will create several pancakes, so lightly respray the pan with olive oil spray between each pouring. 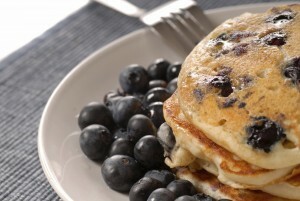 Top the cooked pancakes with Joseph’s Sugar Free Syrup (Available at Wild By Nature,) & serve. Portions: The mixture creates exact ready-to-eat portions for both women & men. 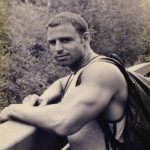 I really wanted to find a way to bring you a pancake recipe that could have berries within it, without elevating the grams of carbohydrates in order to keep stable blood sugar levels. Almond Meal was the ingredient that I finally decided to experiment with to create this delicious Blueberry Pancake recipe! The Almond Meal gives an excellent base, or body to the pancake, and is much lower in carbohydrates than the dry, instant oats that are the main ingredient of my other pancake & waffle recipes. 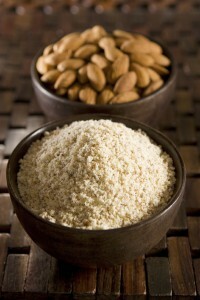 You may grind your own almonds in a food processor, or you may use Bob’s Red Mill Almond Meal/Flour. (The label reads “/Flour,” but it’s actually “Almond Meal” (from finely ground blanched, whole almonds,) which is Remedy Recipes Approved! You may also use strawberries, raspberries, or blackberries rather than blueberries, if you prefer. It took a few attempts to determine the exact ingredients, but I finally perfected it! We hope that you enjoy this delicious recipe as much as we did!